I happened to pick up the DVD of Chotushkone after reading its synopsis at an online shop. It was only after I had watched half of it that I got the news it had bagged the National Film Awards for direction and cinematography. From what I had watched till then my impressions of both these aspects as well as the film as a whole were quite positive. It only remained to be seen if the remainder could match those standards. 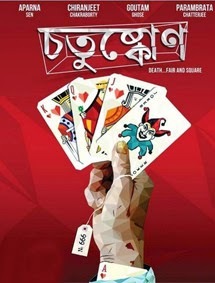 Like the trademark output of that vintage British film company Amicus Productions, Chotushkone is a "portmanteau" film. For the uninitiated, that means a film composed of individual episodes fitted within an overarching narrative frame. The major characters here are four film-makers co-opted by a mystery producer into coming up with four ideas that can serve to make thematically related short films that will be combined into a feature; the requirement is that the running theme through all the stories should be Death. Fans of classic horror / mystery should be immediately attracted to the idea. In a well-played conceit, the four characters are played by real-life Bengali actor-filmmakers - Aparna Sen, Gautam Ghose, Chiranjit Chakraborty and relative newcomer Parambrata Chatterjee. The stories they come up with remind me in a good way of the clever little ideas classic horror shorts are spun from. As the film builds to where these four points of the titular quadrangle come up with their respective story ideas, the script also probes their past history, especially the veteran characters, with fleeting depictions of a troubled marriage between Aparna and Chiranjit (with Gautam as their mutual friend, and possibly silent admirer of Aparna) and its repercussions on their professional life. Without going into too many details that would dilute your viewing experience, Chotushkone has a strong build-up in most part and the enactments of the episodes the directors within the film come up with make for clever and intriguing viewing. It also helps that the film is a strong visual experience, making use of colored lighting and dramatic framing to infuse excitement into the proceedings. Alas, Chotushkone's several merits make its missteps all the more glaring. At nearly 150min the film runs at least 50% longer than it should have, with several easily identified elements that could have been shorn off at the scripting / editing table. A film with this theme should in my view focus exclusively on its lead characters, excluding anything else from the audience's frame of mind, but here you have a fair amount of footage devoted to peripheral characters that have no bearing on the denouement. Songs, even if few and with no elaborate choreography, are just another distraction. And the climax belies the pithy quality of the episodes before it. What should have been delivered as a swift punch to the gut belabors the twist element far too long and features some muggy acting. Also sometimes, the cinematography is fancy for its own sake, with even simple moments lavished with puzzlingly elaborate visual grammar. So yes, what could have been a terrific film does fall a few rungs short, but it is still in most part an exciting and worthwhile watch, especially for fans of suspenseful films. I now need to check out Srijit's previous film Baishe Shrabon.